The Crime Prevention Unit is committed to providing innovative community relations, crime prevention and youth programs focused at reducing crime and improving the quality of life in Brevard County. Identity Theft Theft of identity is fast becoming the most prevalent and costly financial crime in the nation. It is estimated that more than 40,000 people have their identity stolen each year, costing consumers and the financial industry billions of dollars. This presentation explains how criminals can obtain your personal information. It also gives tips on how to protect yourself and what to do if you think you may be a victim. The Brevard County Sheriff’s Office Neighborhood Watch program is a joint effort between our office and neighborhoods across the county that focuses on neighbors and law enforcement personnel working together to increase community awareness and reduce crime. Our Crime Prevention team will facilitate the start up a Neighborhood Watch group in your area and provide your community with a “Brevard County Sheriff’s Office Neighborhood Watch” sign, as well as attend meetings to run the program on a as needed basis. This program also includes an explanation of Operation Identification – marking and recording your possessions. Frauds and Scams This presentation explains the different types of frauds and how they work. It also identifies ways to prevent becoming a victim of a con artist. Two members of our Crime Prevention Unit will visit your home, business, or church to identify any potential interior and/or exterior security problems and recommend solutions. All surveys are confidential and free as well as we will leave the home or business owner with an outdoor sign and sticker for their window. Personal Safety This program discusses steps individuals can take to avoid becoming crime victims. Senior Safety This self-protection and home security program is geared toward the special needs of senior citizens. The File for Life Program enables first responders the ability to locate and obtain your vital medical information in your home, in the event you are unable to speak for yourself in a medical emergency. 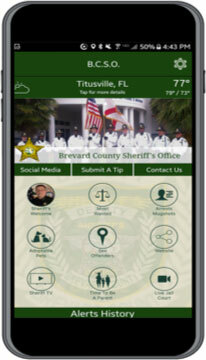 The Brevard County Sheriff’s Office has partnered with Brevard County TRIAD in Project Lifesaver. This program is designed to track and locate lost people suffering from Alzheimer’s, Down’s Syndrome, Autism or other related disorders. A bracelet is provided to the individual that can be tracked using both ground and air tracking receivers. Specially trained deputies assigned to the Brevard County Sheriff’s Office Aviation Unit supervises the tracking. Any restaurant or business, interested in helping to build relationships with their community and the Brevard County Sheriff’s Office, can host Coffee with a Cop. Members of our Crime Prevention Unit attend these events to have a cup of coffee with citizens. It’s an opportunity to ask our deputies questions, talk about concerns, or simply just have a conversation. B.A.M. Brevard Attitude Modification – Brevard Attitude Modification program is designed to address youth who have behavior and attitude issues at home and school. The Behavior Attitude Modification program is offered to both male and females, ages 10-17, pending a review of a completed BAM application. This program is designed to show youth who participate what the consequences of poor attitudes, bad decisions, can be if they continue on the path of those decisions, while also showing them how to make good decisions and teaching them life skills. We do our best to redirect them on a better path for their future. BAM consists of a mock court hearing, jail tour, county morgue tour, physical fitness exercise and a life skills lesson. Each participant will be dressed out in an inmate’s uniform, shackled, and will eat a lunch provided by our jail staff. This program is offered at no cost. Brevard Safe Kids Academy – The Brevard Safe Kids Academy is a two hour program that provides practical instruction to children ages 5 through 12, on stranger awareness, dialing 911, internet safety, home safety, anti- bullying, and fire safety. 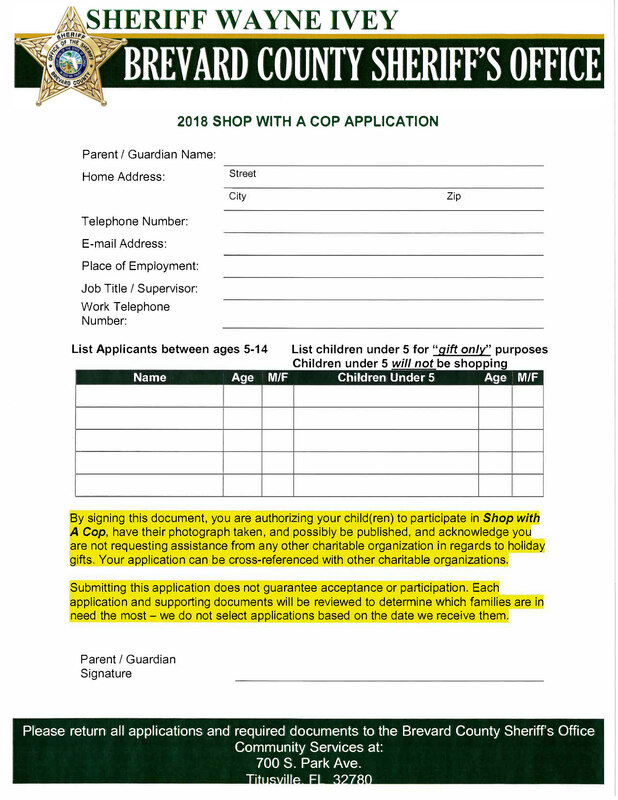 “Shop with a Cop” Shop With A Cop is a program that is designed to help families in need during the Christmas Season, this program is designed to partner children in need with a Brevard County Sheriff’s Office Deputy to go shopping for Christmas Presents for themselves. 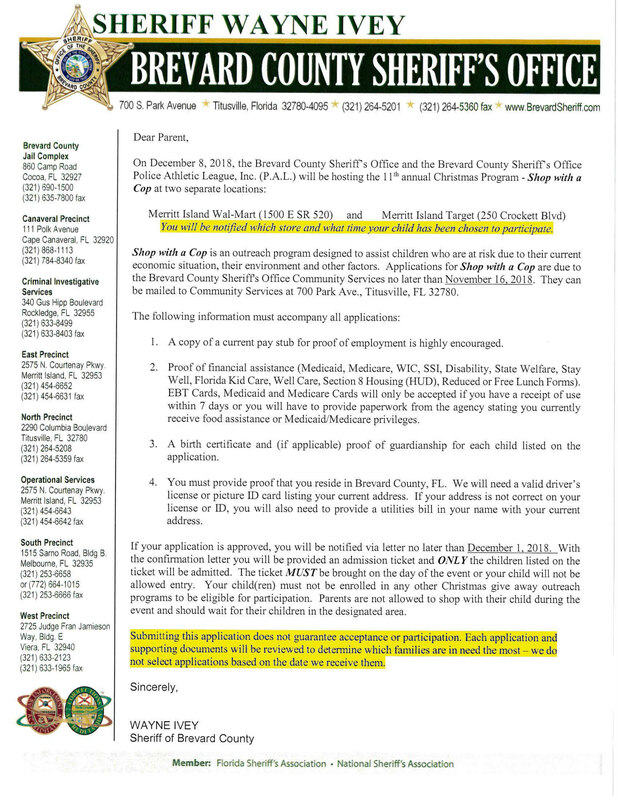 Every year families from across the county submit applications to our Community Services Unit and the Brevard County Sheriff’s Office Charity then helps raise money to meet the need so every child has a present Christmas morning. 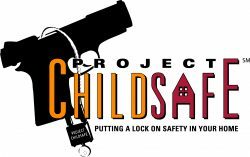 The Brevard County Sheriff’s Office supports the efforts of Project ChildSafe and is happy to provide gunlocks at all of our Precincts as well as at our Community Services Office in The Avenue Viera. For more information on Project ChildSafe, please visit www.projectchildsafe.com. Child fingerprinting is offered at local community event, parents receive the finger print card to keep for their own records. Designed for 4 to 8-year-olds, this program helps children learn to deal safely with strangers – avoiding conversations, knowing what to do when approached and identifying trusted adults to whom they can go for help. Parents are encouraged to attend and to reinforce the concepts discussed. The R.E.A.D.Y. program is a hands on presentation that teaches our citizens hands on exercises that they can use in everyday life if they ever find themselves in a violent situation. They are provided information on the fundamentals of unarmed self-defense. Camp Chance is located at Jakes Lake in Cocoa, and is available to any local non-profit organization for a day, night, or a weekend trip. Organizations have access to our kitchen, classroom, and restrooms. Upon request, canoes are also available for use on the lake. Interested non-profit organization must make reservations, submit an application, provide proof of insurance, and complete adult and minor waivers, if necessary. The Brevard County Sheriff’s Office Milk and Donuts with the Sheriff program was designed for elementary age students have the opportunity to interact with law enforcement in a positive way at an early age. Sheriff Ivey, and a members of our Crime Prevention Unit, visit elementary schools throughout the county, during this event, our team talks about be responsible, being respectful to their teachers as well as they will get the have the opportunity to ask the Sheriff and our team questions all while learning more about law enforcement and our Agency. The Brevard County Sheriff’s Office Great Kids award recognizes youth recipients that go above and beyond to demonstrate hard work, dedication and commitment and over all go above and beyond in their everyday activities to be a positive role model to others. Students are nominated by their teachers, administration and School Resource Officers. For more information call 321-264-7755 or send an email to crimeprevention@bcso.us.